We've got great news for cyclists who use PeriPedal indoor training software: You can now enable Auto-Sync between the two programs — so when you complete a ride, your workout data will automatically upload to SportTracks. This is useful for gaining actionable insight by analyzing the details of individual PeriPedal workouts, and for understanding how these efforts impact your overall fitness, tapering strategies, and Training Load. PeriPedal is an easy-to-use software application for athletes who utilize indoor trainers (which are also referred to as "Turbos" in other parts of the world). It syncs via ANT+ and displays live stats on your computer as you turn the crank (PeriPedal is only compatible with Windows). It's a budget-friendly solution for monitoring your Power, Heart Rate, Speed, Cadence, and more while you work out indoors on a bike. If you have an indoor trainer but lack a power meter, PeriPedal can act as a virtual power meter (if you're unfamiliar with power-based training in cycling, you can learn about it in our Critical Power fundamentals post). PeriPedal also comes with structured workouts, training plans, and many other useful features, such as a media viewer that can pause a Netflix stream when you get off the bike, and automatically unpause it when you return and start pedaling again. Perfect for binge suffering! In order to take advantage of this partnership, you need to enable the connection between SportTracks and PeriPedal. This requires an account on both platforms. If you're not yet a SportTracks user, you can easily sign up for a 45-day free trial to test this out. There are no obligations, and you won't be charged at the end of the trial. In PeriPedal, click on "Edit Profiles" and scroll down to "SportTracks Settings." Click the button labeled "Connect with SportTracks." Log into SportTracks, and authorize PeriPedal to access your account by clicking on the "My Account" link in the upper right corner of the SportTracks interface. Click on "Sharing," and then click the "Connect" button. Select the PeriPedal option from the menu. That's it! 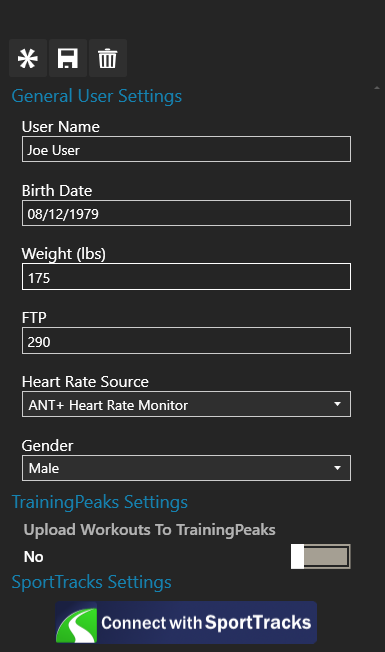 This integration will add a new dimention of utility to the workout data that's generated from your PeriPedal sessions. Moxy Monitor users will be especially pleased because both PeriPedal and SportTracks feature blood oxygenation data integration.